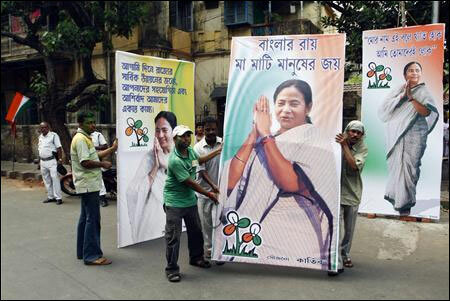 In a setback to West Bengal government led by Mamata Banerjee, Calcutta High Court on Friday held as unconstitutional and void Singur Land Rehabilitation and Development Act, 2011, under which the state had vested land leased to Tata Motors. Giving its verdict on an appeal by Tata Motors Ltd, a division bench comprising Justices Pinaki Chandra Ghosh and Mrinal Kanti Chaudhury observed that the President's assent had not been taken for the Act and as such it was void and unconstitutional. The implementation of the order was, however, stayed for two months by the division bench to allow the aggrieved party to appeal before a higher court. The division bench set aside the order of Justice I P Mukerji who had held the Act to be constitutional. It observed that the single bench had no jurisdiction to fill up loopholes left by the legislature. 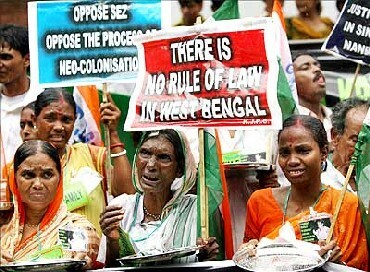 Tata Motors had challenged the order of the single bench of Calcutta High Court, which had upheld the Singur Land Rehabilitation and Development Act, 2011, by which the West Bengal government vested the land leased to the company at Singur, before the division bench of the court. Tata Motors had appealed against the order of Justice Mukerji, which was passed on September 28, last year. Justice Mukerji had held the Singur Land Rehabilitation and Development Act 2011 to be constitutional. The court had, however, ordered on September 28 an unconditional stay of the judgement till November two to allow any aggrieved party to file an appeal, if it so desired. Tata Motors had been leased 997 acres at Singur in Hooghly district, about 40 km from here, by the previous Left Front government for its Nano car project, billed as the cheapest car. Trinamool Congress, which was then the main opposition in West Bengal, had demanded return of 400 acres to farmers unwilling to give land for the project. 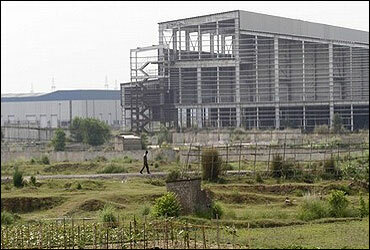 Tata Motors had moved its Nano small car factory to Sanand in Gujarat in 2008 citing law and order problems, but had kept possession of the leased land at Singur. 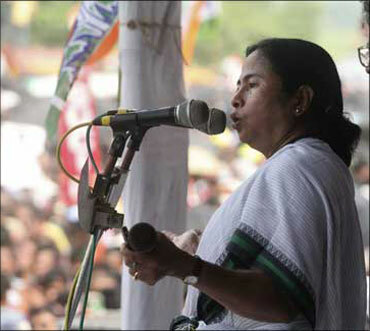 After coming to power in May 2011, Chief Minister Mamata Banerjee had the Singur Act passed in the Assembly as one of her government's first major legislations. Counsel for the state government Kalyan Bandyopadhyay, who is also a Trinamool Congress MP, said that the state would appeal against the order in the Supreme Court. 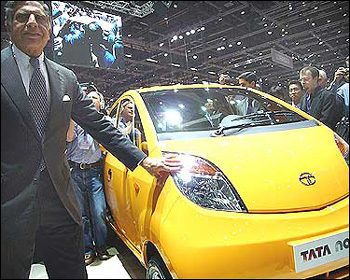 Image: Ratan Tata with Nano. The West Bengal government said on Friday it would decide its next course of action only after getting a copy of the verdict. "We have not received the copy of the court verdict. The state government will take action only after getting it," Commerce and Industry Minister Partha Chatterjee told reporters in Kolkata. 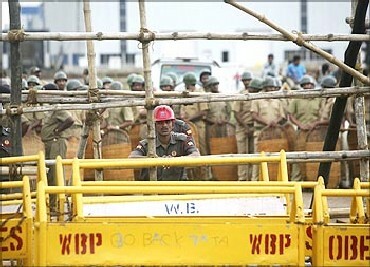 which the state had vested land leased to Tata Motors. Image: Tata Nano factory in Singur. Chatterjee also assured the people, farmers and land labourers in Singur that they were with them and would continue to stand beside them. "We were with them, we are with them and we will be with them. We are committed to protect their interest," he said, recalling that Trinamool Congress chief Mamata Banerjee had observed a 26-day fast in Singur to protect the interests of farmers. He said the state government was committed to return the land of unwilling farmers and protect interests of land labourers. 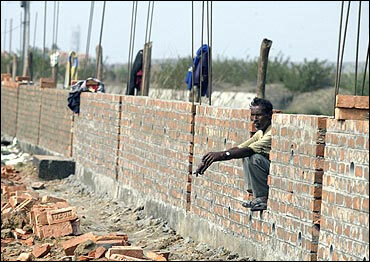 Image: A farmer at the Singur site.